IF: THE LIVING WEAPON / BATMAN ETERNAL / ALL-NEW ULTIMATES [Reviews]: An ‘Iron Fist’ful. Continue reading "IF: THE LIVING WEAPON / BATMAN ETERNAL / ALL-NEW ULTIMATES [Reviews]: An ‘Iron Fist’ful." CAPTAIN MARVEL / MAGNUS / MONSTER & MADMAN [Reviews]: Mmmm…?!?!! Continue reading "CAPTAIN MARVEL / MAGNUS / MONSTER & MADMAN [Reviews]: Mmmm…?!?!!" SHE-HULK / X-FORCE / THE FUSE #1 [Reviews]: All You Need is Love/Violence! Continue reading "SHE-HULK / X-FORCE / THE FUSE #1 [Reviews]: All You Need is Love/Violence!" Continue reading "EARTH 2 / DREDD – UNDERBELLY [Reviews]: Oh, the In’MUTANT’ity…"
MIRACLEMAN #1 [Review]: Miracle on 135 W. 50th Street. Continue reading "MIRACLEMAN #1 [Review]: Miracle on 135 W. 50th Street." 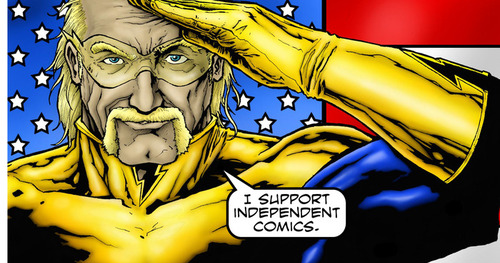 TOP 10 INDIE COMICS of 2013 [Face-Off]: Whatcha Gonna Read, BROTHER!?!! Continue reading "TOP 10 INDIE COMICS of 2013 [Face-Off]: Whatcha Gonna Read, BROTHER!?!!"